Home >> Generated from JAN's SOAR Information System on 4/26/2019 4:06:50 AM. 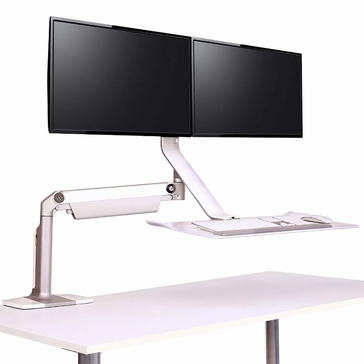 The Humanscale QuickStand Lite Height Adjustable Workstation - Dual Monitor features the same innovative adjustment of Humanscale's Dual Monitor QuickStand desktop converter, with more flexibility and an even smaller footprint. The Quickstand Lite lets you transform your fixed height desk into an active workstation by securely attaching on to almost any surface and providing intuitive, counterbalanced adjustment for your keyboard and monitor.